Presenting a spades bridge and poker Christmas tree ornament with authentic Swarovski rhinestones. Ornament is shown and is only available in black. Spade bridge and poker Christmas tree ornaments with authentic Swarovski rhinestones can be purchased at Designer Ornaments. 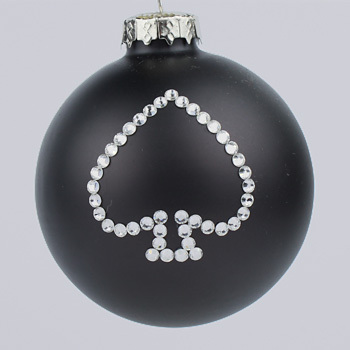 Spade Christmas tree ornaments featuring the suit of spades can be purchased at Designer Ornaments.